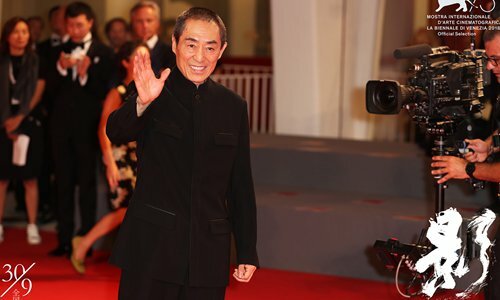 Renowned Chinese director Zhang Yimou's latest feature film Shadow debuted to critical acclaim after its world premiere at the 75th Venice International Film Festival on Thursday. Following a story about a king's look-alike, the almost entirely monochrome film was screened out-of-competition at the local theater Sala Grande on Thursday. Zhang and a number of the film's cast attended the screening. "Venice is kind of a blessed land for me," the director said in an interview with Chinese media Sina Entertainment before the premiere. "I have received a lot of awards here. The Venice film festival is my most frequently visited film festival." Zhang was awarded a Silver Lion for his Raise the Red Lantern at the 48th Venice film festival in 1991 and a Golden Lion the next year for his The Story of Qiu Ju. In 1999, the director was awarded a Golden Lion again at the 56th Venice Film Festival for his Not One Less. This year, Zhang received the Jaeger-LeCoultre Glory to the Filmmaker Award at the festival on Thursday for his cinematic contributions. Previous recipients of the award include Spike Lee and Sylvester Stallone. After his disputed 2016 China-Hollywood co-production The Great Wall, the director seems to have made an impressive comeback with Shadow in Venice as many of the overseas reviews have been positive, with the Hollywood Reporter dubbing it "probably the most stunningly beautiful film Zhang has made." A Variety review calls the film's images "the spectacular star of famous Chinese director Zhang Yimou's sumptuous return to form." The film is set to screen at the Toronto International Film Festival this week and hit Chinese mainland cinemas on September 30.